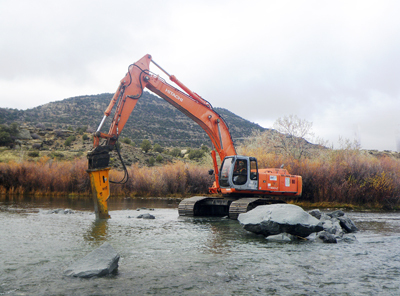 NAVAJO DAM – The world-class, trophy trout waters of the San Juan River became hotter than ever this month as crews completed a $300,000 project to enhance fish habitat and control sediment. After a month of construction in a section of the river called “The Braids,” anglers returned to find deeper channels, new holes and more fish in the famous stretch of river below Navajo Dam. Spawned by a management plan in 2005, the project came to fruition this year thanks to an appropriation approved by the state Legislature. Additional funding was provided by an excise tax on fishing and boating equipment through the federal Sport Fish Restoration Program. Wethington said anglers are excited about the project, which has opened about 3/8 of a mile of good fishing in a stretch where there were very few trout before. Crews with contractors Albuquerque Underground Inc., Aquatic Consultants Inc., and Riverbend Engineering dug through sandstone bedrock to create 21 new fishing holes ranging from three to five feet deep. Large cottonwood trunks, boulders and faux beaver dams were strategically placed to redirect flows into the pools. The project included building a sediment retention area at the mouth of Rex Smith Wash, an arroyo that empties into the “Kiddie Hole,” a popular fishing spot just above “Texas Hole.” Flash-flood events carry silt into the river at that point, damaging trout habitat there and downstream. The retention pond will slow the water flow during floods, catch sediment and redirect clean water back into the river.